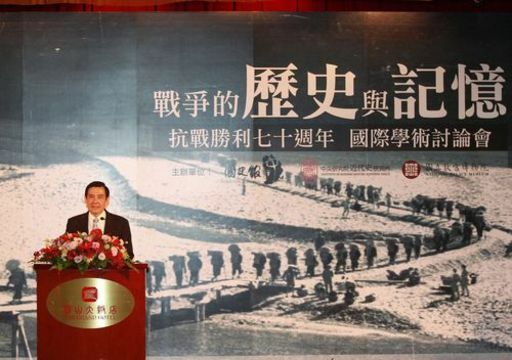 Taipei, July 7 (CNA) President Ma Ying-jeou (馬英九) on Tuesday explained his stance on Japan, describing himself as Japan-friendly while rejecting the "pro-Japan" or "anti-Japan" labels political pundits have given him. On history, "my stance is that we should deal with issues based on their merits, show empathy to others, and distinguish kindness from hatred," Ma said while addressing an international conference marking the Republic of China's victory in the War of Resistance against Japan in 1945. The eight-year war was part of World War II, in which Japan and the other Axis Powers were defeated. Some people, Ma said, see him as pro-Japan because of a park he decided to build shortly after taking office in 2008 that commemorates a Japanese engineer. The park is dedicated to Yoichi Hatta, who designed the Chianan Canal (嘉南大圳) and the Wusanto Reservoir (烏山頭水庫) when Taiwan was under Japanese colonial rule (1895-1945), projects that helped increase rice production in Taiwan. Others, however, have labeled him as "anti-Japan" for attending events commemorating the victory over Japan and paying attention to the issue of Taiwanese "comfort women," who were forced into sexual slavery by the Imperial Japanese Army during World War II. Rejecting both of the labels, Ma described himself as "Japan-friendly." Ma said he believed that a true friendship is based on such principles as dealing with issues based on their merits, showing empathy and distinguishing kindness from hatred, principles, he said, that will help the ROC and Japan establish a lasting friendship. The peace treaty signed in 1952 between the ROC and Japan known as the Treaty of Taipei covers the importance of bilateral cooperation, and his administration has followed the spirit in the treaty and made efforts to advance ties with Japan, Ma said. Since Ma took office in 2008, Taiwan and Japan have signed 25 agreements, bringing the total number of bilateral agreements to 58 (from 1972 to the present), he said. Ma also proposed the East China Sea Peace Initiative in August 2012, which called for peaceful solutions and joint development of resources to address disputes in the East China Sea region. That proposal led to the signing of a fishery agreement between Taiwan and Japan to address fishing disputes in their overlapping waters, he said. Countries such as the United States and Australia praised Taiwan's efforts to deal with territorial disputes with peaceful solutions, the president said. Taiwan and Japan also signed an open skies agreement in 2011, allowing for more direct flights between the two countries. Last year, a total of 2.97 million Taiwanese nationals visited Japan and 1.63 million Japanese visited Taiwan, he said. "Relations between our country and Japan are at their best in more than 40 years," he said, stressing that the relationship will not be affected by the series of events taking place in Taiwan to mark the anniversary of the end of war. "The mistake of invasion may be forgiven, but the historical truth cannot be forgotten," he said. Ma said he will continue efforts to promote ties with Japan, while facing history and looking to the future. The three-day International Conference on the 70th Anniversary of China's Victory in the War against Japan, which kicked off Tuesday, has brought together local scholars and experts from Japan, Canada, China, Germany, the United Kingdom and the United States, according to Academia Historica, which is organizing the event. The activities are being held in Taiwan because it is known formally as the Republic of China. That was the name used for all mainland China from 1912 to 1949, but the ROC's seat of government moved to Taipei after the Nationalist government was defeated by the Communists in the Chinese civil war and retreated to Taiwan.